Crate training a dog is among the best things a dog owner can do for both the dog and themselves, and we've discussed the many reasons as to why. Yet, some dog owners still view placing a dog in a crate as a cruel thing to do, largely because they don’t see the purpose of the dog crate. Dog crates allow us to better train, transport and confine the dog when needed, which makes them some of the most versatile and useful tools in a dog owner’s arsenal. Sadly, most kennels are made of metal, plastic or soft materials, which make them cheap looking and not very appealing in design; they will rarely compliment your home decor. 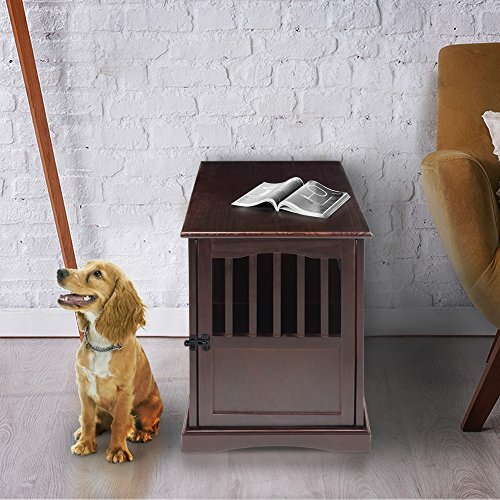 Dog crate furniture is a new trend that's changing that, providing pet owners with best looking wooden pet crates that you won't wish you could hide from your guests. What separates dog crate furniture from regular dog crates or kennels is that it’s a visually appealing type of pet crate that looks good together with the rest of your own furniture and home decor. The major drawback of regular dog kennels is that they are rather unappealing to look at. This means that you’ll either have to make peace with having an ugly wire cage in your living room or, even worse, leave the crate outdoors or in a basement, essentially making your dog feel excluded and punished. 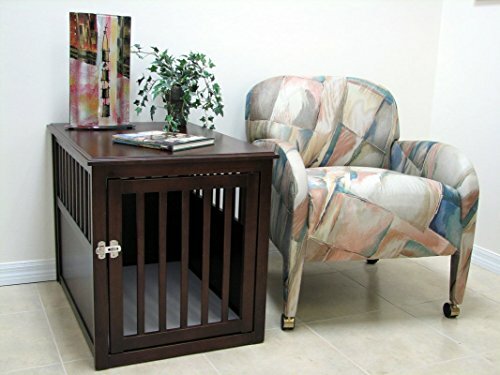 Instead, a beautiful piece of dog crate furniture that’s specifically chosen to match your houses’ furniture color and design can not only be a pretty addition to your home but it can even double as a side table for you to put magazines and books on. It can also act as a nightstand for your bedroom while giving your dog the freedom to sleep next to you without being on the actual bed. Why You Might Need Dog Crate Furniture? • Crates help with separation anxiety in dogs, a well-documented problem. If you’ve crate-trained your pooch properly, however, they can derive comfort and calmness from the crate while resting there in your absence. Of course, just getting a dog crate is not enough – you’ll have to go through the crate training process and you’ll still have to make sure that you’re giving your dog a lot of attention throughout the rest of the day so that he/she is tired and in need of some rest while you’re gone. • A pet crate can also give your dog a secure place to hide in when he/she are experiencing stress for whatever reason – guests, home renovation, etc. • Crate training helps dogs to control their bowels and learn to hold it for when they are outdoors. • A kennel spares your Fido the isolation of being left outside or in the basement when you must restrict him/her from certain areas of the house. • They make it easier to transport your pup as they will have been taught to feel comfortable in the crate. This allows you to take the dog with you more often rather than leaving him/her home alone all the time. • They also give you the peace of mind of leaving your pooch home alone for a short period of time. • A crate allows you to house-train your Fido as well as to introduce new pets in your home in a safe way. The two advantages that dog crate furniture has over regular kennels, and the reason why you may want to choose them, is their more appealing look and functionality, such as using them as an end-table, night-stand and so forth. The main thing to keep in mind is that most pieces of furniture-like dog crates are made for pups that are already crate trained. While there are plenty very sturdy furniture crates, many of them won’t be as durable as a thick metal kennel, since their design is focused on having a beautiful look that will fit your home decor. Getting furniture dog crates for an untrained canine will usually result in your pet chewing through the doors or bars, and breaking free in minutes. Instead, it’s recommended to first crate-train your pup with a sturdy (and cheaper) metal dog kennel and only after that buy a beautiful piece of furniture-like pet crate to go with your home’s interior. 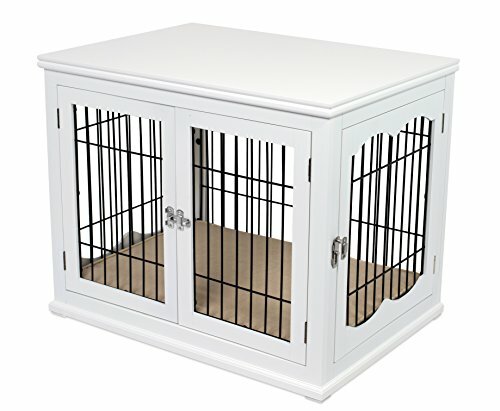 How to Choose a Good Furniture-like Dog Crate? The dog crate needs to not only be big enough to fit your dog but also to fit him/her comfortably. The purpose of the crate isn’t to just confine your pet but to be the preferred place of rest for him or her. As dog crate furniture is meant to be a nice-looking addition to your home’s furniture, paying extra attention to how it fits your home’s interior is important. Otherwise, you might as well get a metal cage kennel. Dog crate furniture isn’t meant to be as sturdy as a dedicated metal dog kennel but it still has to be durable enough to last for a long time. Extra features. Things such as a removable bottom tray for easier cleaning, extra doors, an included dog bed, etc., are all great features to have. While compromising the quality in favor of the price is not a good idea when talking about a product that’s meant to last for years, paying attention to the price is still a good idea. Below are five of our favorite choices of best dog crate furniture brands which are intended to be as beautiful as well as practical. Given their price tag, it's best that you crate train your pup with a cheaper kennel first before opting for using any of these wooden dog crates. This wooden dog crate by Crown Pet Products comes in two different sizes – one for dogs up to 45 pounds in weight and one for larger pooches reaching 80 pounds. The crate is also available in two colored lacquered finishes – one lighter and one darker so that they can fit with almost any furniture composition. The crate is made out of a durable hardwood that resembles teak wood. It has a waterproof melamine-covered MDF floor which makes it easy to clean and odor-absorbent. There are wooden bars on all 4 sides, giving your dog excellent ventilation and visibility all around him or her. The only drawback is that wooden bars can be chewed through by larger, untrained, and more determined dogs. Waterproof MDF floor that’s easy to clean and is odor-absorbent. Comes in two sizes and in two color finishes to match all dog breeds and interior designs. The wooden bars are soft and easy to chew-through if your dog is determined enough. This great-looking wood and wire dog crate by Internet’s Best is a beauty to look at. It comes in two colors – white or black – to go with any interior design. It has external dimensions of 23” W x 32” L x 26” H and interior dimensions of 21.5” W x 30” L x 24” H. It is large enough to comfortably hold dogs that are up to 58 pounds heavy. In terms of design, this wooden crate has two doors – one on the front and one dual-wing door on the side. It also comes with a 2.75” padded dog bed for extra comfort. On the negative side, the spindles are rather thin and can be broken by an untrained dog and the doors themselves can use a second set of bolts to hold them closed. Gorgeous design that comes in two colors and can go with any furniture design. Two doors for extra versatility. Comes with a fitting cushion dog bed. The slide bolt on the larger side door is not strong enough to hold purposeful pressure. Installing a second bolt is a good idea. The wooden spindles can be chewed through by determined and untrained dogs. For a gorgeous, fully wooden pet crate, this Casual Home item provides a stylish option. It comes in several different sizes that can accommodate dogs ranging in size from 25 to 150 pounds. There is ample air flow coming from all sides thanks to the open design. The door is well latched-on, however, upon assembly, you may find that there are missing screws. Additionally, in a lot of the items, the screw holes aren’t all drilled correctly. Simply put, the first assembly may be a bit time-consuming. Once it’s put together, however, this Casual Home crate is sturdy enough for dogs of the appropriate size, as long as they are crate trained. The budget-friendly price is also a plus. 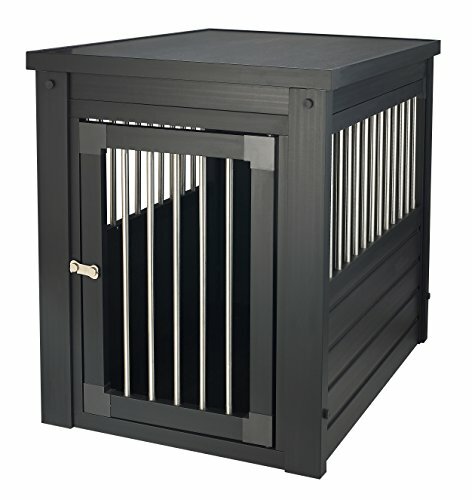 Comes in a lot of different sizes, allowing you to choose the perfect crate for your dog. Stylish and beautiful crate to add to your home’s interior. There is a slight design issue with some of the screw holes as they are not drilled right. There are missing screws with most purchases too. Marketed as a 2-in-1, this pet crate is more of a 3-in-1. Not only does it work well as a pet kennel, as well as a living room wooden side table but it can also be reassembled into a pet gate if need be. The wooden door of the crate has a durable hatch that’s hard to open for the dog. The nice wood and design make this into a nice piece of furniture that won’t intrude on any room’s overall design. This crate comes in two sizes – 32.5” L x 23.5” W x 22.5” H medium interior dimensions and 40” L x 28” W x 31.5” H large interior dimensions. There is also a removable plastic tray to place at the bottom for easier cleaning. Keep in mind, however, that this crate isn’t for untrained dogs as the top isn’t latched onto the rest of the crate and the spindles aren’t too durable to direct pressure. This crate is for trained dogs. This crate pet furniture also doubles as a pet gate. Very quick and easy to assemble. Has a removable tray for easier cleaning. The top piece is not latched on. If your dog has separation anxiety or isn’t crate-trained you might want to add latches to the top piece yourself. The thin spindles are easy to break by a nervous dog that is desperate to get out. 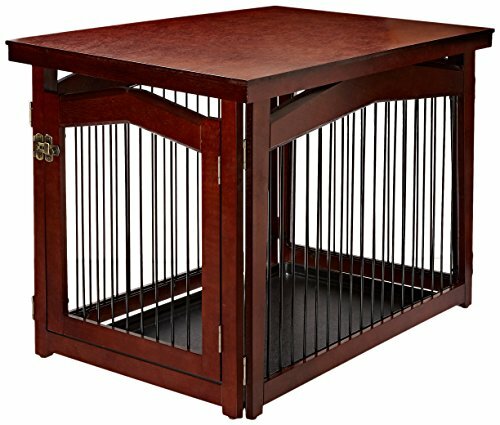 This stylish dark-brown New Age Pet crate table is a great item for dog owners with create-trained pooches. The small crate is for dogs of 20 pounds of weight or less while the X-Large crate is for dogs that are up to 100 pounds. The crates are made out of a non-toxic recycled plastic-wood that isn’t easy to crack or split. When seen in person it does have a distinctive plastic look to it, but it also resembles wood more than enough to fit in with most rooms’ furniture designs. The crate has metal spindles on all sides, giving the dog enough visibility to its surroundings so he/she doesn’t feel punished or restricted. The nice flat top of the crate makes for a comfortable mini table for your bedroom or living room. Nice design to have in almost any room. The metal bars are hollow and any nervous dog that isn’t crate-trained will chew them off with relative ease. Instead of having an unappealing and cheap-looking metal wire crate that you wish you could hide from your guests, a good looking and high-quality piece of dog crate furniture will give your pooch a comfortable crate to rest in and will compliment your home decor. Any of the above mentioned best looking dog crates made of wood are durable enough to last for a long time, match your dog’s size and have additional furniture-like functions.